After Getting Domain Name for your blogspot blog, it will not redirect to your blog without adding "WWW" prefix before domain name, even I was getting this problem after getting domain name. I mean, if your blog is not found after writing your domain name only, like for mine "Bloggerhowtoseotips.com, then it will not automatically redirect to http://www.Bloggerhowtoseotips.com, if you will not do small steps on blogger, after adding domain name to blogger. That's enough for knowing the exact problem. So, I finally found the solution for it. Go to Blogger.com<Then Go to Blog Dashboard<Click On Settings<Find Publishing Section Where You Have Added Your Domain Name. If these above steps are difficult for you, then read my step by step guide to reach "Publishing Section". 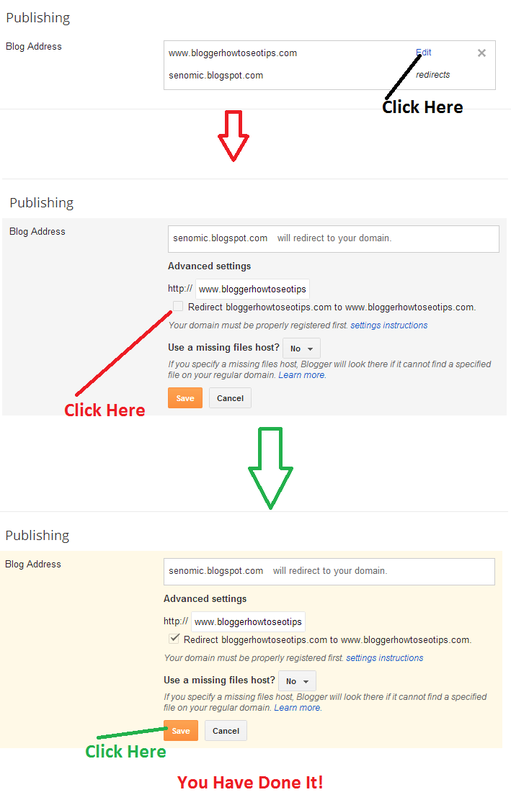 Now Click on Edit<Then you will see "Redirect bloggerhowtoseotips.com to www.bloggerhowtoseotips.com", but there you will see your domain name, before this you will see a box, just check that box okay then you will see right sign on that box and then click on Save. I know these steps are little difficult for newbies, that's why I have created it's screen shot but step by step that's why any one can do it quiet easily. Hopefully you did it. if you are facing any problem to do these steps then let me know, I will definitely help you. See, there are many reasons I can share with you, but I don't want to share with you un-necessary reasons those are not useful for you, I am sharing with reasons those are useful for you. Although, all these three reasons are related to only one thing that is whenever people will about your blog, then they are not going to type www before your domain name. That means, if you will not fix it then probably it will be a loss for you, so why to loose your favorite blog readers and it will take only few minutes to do and it will be there for forever. See, there are 200 factors on those basis search engine Google shows result, but I have not heard that it will effect on SEO. It will definitely put effect on branding of your blog. The reason is simple, people can not access to your blog without adding www, see only we (I and you) can understand this fact, that if the blog is not opening then we must add www before the website. But, I bet you about 90% internet user's are not familiar with all these things, then what next? You can easily guess, they will switch to another blog and I hope you don't want that the same fact will happen with your blog. See, the way I have express above that is one of the simplest way to fix this problem, but other than this if you want to fix this problem then you need to go to your domain manage panel. Although these two domain registrar service provider good for me so far, if you are still blogging without domain name then I will strongly recommend you to buy one. If you are not good in technically then you can inform me, I will help you, like buying domain name for blogger to adding domain name to blogger. It is a simple tutorial about fixing a problem domain name not working without WWW prefix, this tip is working 100% if you have any other problem about blogging let me know? Is there any simple mistakes you made in blogging? I think you are doing awesome today, well you are right but I think adding this feature is very good for bloggers. If you need any other help let me know? I have checked mydomain.com redirect to www.mydomain.com. Hello, I will suggest you to use Godaddy Classic DNS feature to make it easier for you. Otherwise you must contact Godaddy support team for solving this problem.